Local philanthropist, community leader and UC San Diego supporter Anne Ratner has died at the age of 100. For more than six decades, Ratner has been a beloved volunteer and philanthropist in San Diego, actively supporting numerous arts, sciences, service and Jewish organizations. 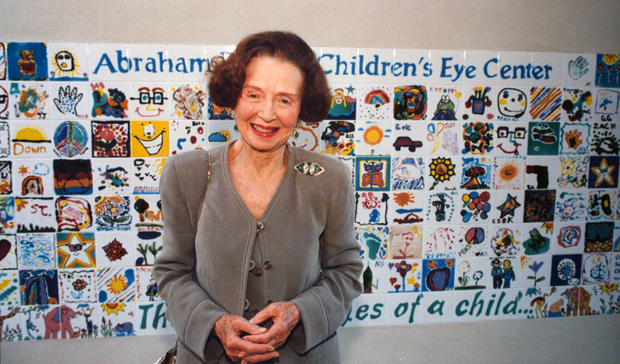 In 1993, she donated the funds to establish the Anne F. and Abraham Ratner Children’s Eye Center at the Shiley Eye Center at UC San Diego. Since that time she has supported a wide range of campus areas. Ratner was honored earlier this year with a Chancellor’s Medal, one of the university’s highest honors given for exceptional service in support of UC San Diego’s mission. Ratner was a dedicated supporter of UC San Diego since 1967, when she and her husband, Abraham, were among the original members of the Chancellor’s Associates donor group. The Ratner Children’s Eye Center, which opened its doors in 1995, treats over 10,000 patients each year. She also created the Anne F. Ratner Endowed Chair in Pediatric Ophthamology to attract an outstanding pediatric ophthalmologist to the facility and played a key role in establishing the EyeMobile for Children at the Shiley Eye Center. The EyeMobile serves low-income children and offers vision screenings, eye exams and glasses free of charge. “I am motivated by my concern for children to start their life free of any curable impediment to their eyesight. The children of San Diego needed an eye center that was made for them,” Ratner was quoted as saying about her support to the Ratner Children’s Eye Center. Ratner has also supported the Judaic Studies Program at UC San Diego, undergraduate scholarships, The Preuss School UCSD and the UC San Diego Moores Cancer Center. Most recently, Ratner gave $800,000 to UC San Diego to establish the Ann Ratner Family Fund for Breast Cancer Research and the Anne Ratner Family Fund for Stem Cell Research. In total, Ratner donated nearly $5 million to various areas throughout the UC San Diego campus. Funeral services will be held on Nov. 11 at 1 p.m., at the Tifereth Israel Synagogue located at 6660 Cowles Mountain Boulevard in San Diego. In lieu of flowers, the family suggests contributions in her memory be made to the UC San Diego Ratner Children’s Eye Center or the Tifereth Israel Synagogue. Donations to the UC San Diego fund can be made online at givetoucsd.ucsd.edu; please search Ratner Children’s Outreach and Education Fund. Checks can also be made payable to the UC San Diego Foundation, with Ratner Children’s Outreach and Education Fund in the memo, and mailed to 9500 Gilman Drive, #0940, La Jolla, CA 92093-0940.